Lowe syndrome and Dent disease are two conditions that result from mutations of the inositol 5-phosphatase oculocerebrorenal syndrome of Lowe (OCRL) and share the feature of impaired kidney proximal tubule function. Genetic ablation of Ocrl in mice failed to recapitulate the human phenotypes, possibly because of the redundant functions of OCRL and its paralog type 2 inositol polyphosphate-5-phosphatase (INPP5B). Germline knockout of both paralogs in mice results in early embryonic lethality. We report that kidney tubule–specific inactivation of Inpp5b on a global Ocrl–knockout mouse background resulted in low molecular weight proteinuria, phosphaturia, and acidemia. At the cellular level, we observed a striking impairment of clathrin-dependent and -independent endocytosis in proximal tubules, phenocopying what has been reported for Dent disease caused by mutations in the gene encoding endosomal proton-chloride exchange transporter 5. 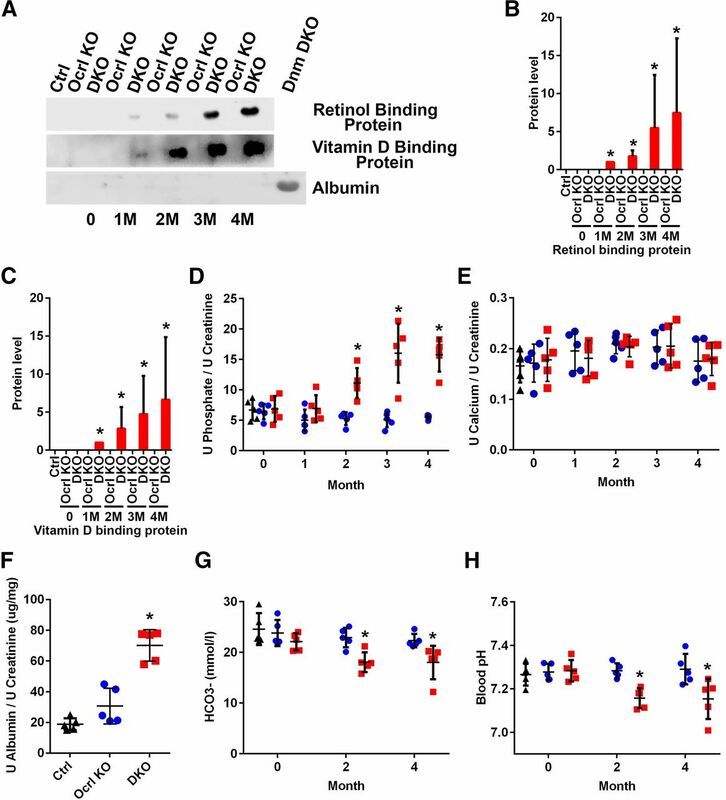 These results suggest that the functions of OCRL/INPP5B and proton-chloride exchange transporter 5 converge on shared mechanisms, the impairment of which has a dramatic effect on proximal tubule endocytosis. The goal of this study was to determine whether the combined absence of both OCRL and INPP5B in mouse kidney proximal tubules results in a defect similar to that observed in patients with Lowe syndrome and whether these changes are, at least in part, due to an impairment of endocytosis. Because germline KO of both Ocrl and Inpp5b results in embryonic lethality,23 the Inpp5b gene was conditionally deleted in kidney proximal tubules of germline Ocrl global KO mice. These mutant mice exhibited dramatic defects in proximal tubule reabsorption that mimicked what has been observed in patients with Lowe syndrome.4 After induction of genetic recombination of the Inpp5b locus in germline Ocrl global KO mice, microscopic analysis of their kidneys revealed a striking defect of both clathrin-dependent and -independent endocytosis at the apical pole of kidney proximal tubule cells. These results provide support to the hypotheses that Clcn5 and Ocrl are functional partners and that the different effects of Ocrl mutations in humans and mice are likely due to the different contributions of INPP5B to kidney function in the different species. To achieve kidney tubule excision of the Inpp5b gene in germline Ocrl KO mice, doxycycline–inducible Pax8rtTA TetO-cre mice27 were interbred with Inpp5bfl/fl28 and Ocrl KO mice23 (Figure 1A). On administration of doxycycline, Pax8rtTA TetO-cre mice express Cre in most sections of the kidney tubules, including the proximal tubules, but not in the glomerulus.27 Two-month-old Pax8rtTA TetO-cre; Inpp5bfl/fl; Ocrl KO mice resulting from the crossing of Pax8rtTA TetO-cre; Inpp5bfl/fl; Ocrl +/− mice were treated with doxycycline to induce loss of INPP5B expression in kidney tubules, thus generating mice that lack both OCRL and INPP5B selectively in kidney tubules (conditional double knockout [cDKO]). Littermate mice lacking the TetO-cre gene (Pax8rtTA; Inpp5bfl/fl; Ocrl +/+ lacking TetO-cre) or lacking both the TetO-cre gene and a functional Ocrl gene (Pax8rtTA Inpp5bfl/fl; Ocrl KO lacking TetO-cre) were used as control or Ocrl KO, respectively. Absence of Ocrl (Figure 1B) in Ocrl KO and cDKO mice was confirmed by Western blotting. Loss of INPP5B could not be assessed by Western blotting, because INPP5B immunoreactivity was below the detection limit of available antibodies. Thus, Inpp5B gene disruption after 2 weeks of doxycycline induction was confirmed by analysis of Inpp5b mRNA expression (Figure 1C). cDKO mice were viable and appeared normal. 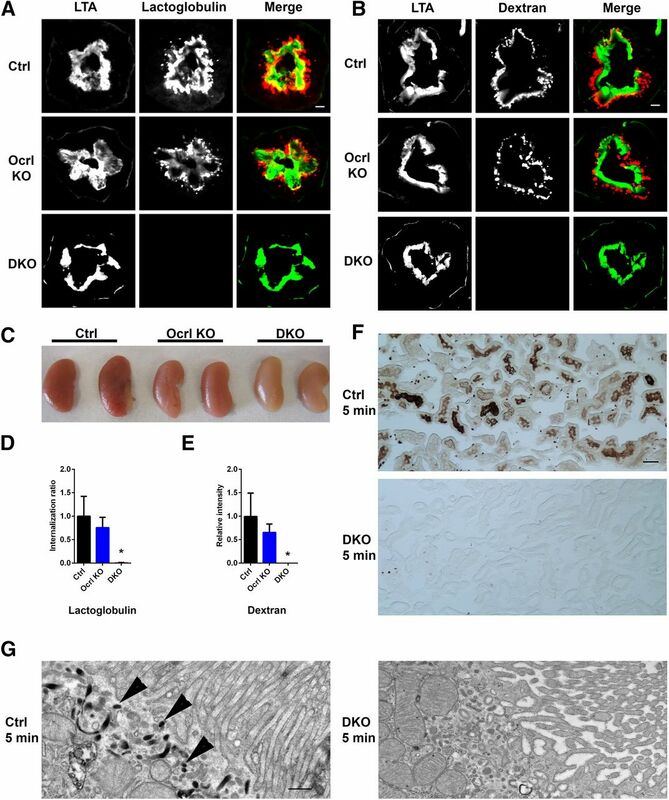 Normal kidney histology and function are observed in cDKO mice within 3 months of doxycycline induction. (A) Ocrl, Inpp5b, Pax8rtTA, and TetO-cre genotypes confirmed by tail genotyping. (B) Expression of OCRL in control, Ocrl KO, and cDKO renal cortex by immunoblot. (C) Inpp5b mRNA expression in control, Ocrl KO, and cDKO renal cortex by RT-PCR. *P<0.05 (n=3). (D) Representative low–power images of H&E–, periodic acid–Schiff (PAS)–, and trichrome–stained kidney sections from control, Ocrl KO, and cDKO mice. Interstitial fibrosis (arrowheads) is observed in cDKO mice kidneys at 8 months after doxycycline induction when stained with trichrome. Scale bars, 50 μm. (E) Quantification of interstitial fibrosis in control, Ocrl KO, and cDKO at 1, 3, and 8 months after doxycycline induction. *P<0.05 (n=3). (F) cDKO mice show elevated plasma creatinine 8 months after doxycycline induction. *P<0.05 (n=4). (G and H) Isolated renal brush border samples from control, Ocrl KO, and cDKO mice kidneys at (G) 1 and (H) 3 months after doxycycline induction immunoblotted with megalin, NaPi2a, and NHE3 antibodies. (I–K) Quantification by densitometry of the immunoblots of proteins in H. *P<0.05 (n=3). Histologic examination of the kidney cortex on the basis of H&E, periodic acid–Schiff, and trichrome staining did not show obvious changes at early time points (1–3 months) after doxycycline induction (Figure 1D). This indicates that the lack of both Inpp5b and Ocrl does not result in cell death, although a decrease in the levels of megalin, NaPi2a, and NHE3, three proteins expressed at the apical surface of proximal tubule cells,29–31 was observed at 3 months but not at 1 month (Figure 1, G and H and quantified in Figure 1, I–K). Furthermore, there was no evidence of kidney failure in these mice within the first few months after doxycycline induction (Figure 1F). However, by 8 months, a general demise of kidney function was observed with the onset of interstitial fibrosis (Figure 1D and quantified in Figure 1E) and elevation of plasma creatinine (Figure 1F). Assays assessing proximal tubule function were performed at 2 weeks and 2 months before these changes occurred. One month after doxycycline induction, the urine of cDKO mice showed elevated levels of the retinol and vitamin D binding proteins (Figure 2A), two proteins that are filtered by the glomerulus and reabsorbed in the proximal tubule, with elevation in the urine that is characteristic of Lowe syndrome and Dent 1 and 2 disease.8 Such phenotype worsened over the ensuing months (Figure 2A and quantified in Figure 2, B and C). Significant albuminuria, however, was not observed in cDKO mice (Figure 2A), indicating that the kidney filtration barrier was intact in the cDKO mice. For comparison, there was massive albuminuria present in the urine of podocyte–specific dynamin 1 and 2 double–KO mice, where the glomerular filtration barrier is drastically perturbed (Figure 2A).32 However, on quantification of urinary albumin by ELISA (Figure 2F), there was a mild increase in albuminuria relative to controls, which can likely be explained by reduced reabsorption by proximal tubular endocytosis of the small fraction of this protein that escapes the glomerular filtration barrier.8,33 To further characterize proximal tubular function, urine calcium and phosphate levels (normalized to creatinine) were analyzed in control, Ocrl KO, and cDKO mice by ELISA starting at 1 month after doxycycline induction. Phosphaturia (Figure 2D) was observed in cDKO mice, which continued to progress as the mice aged, whereas there was no difference in urine calcium levels between control and cDKO mice (Figure 2E). Consistent with the metabolic acidosis typically observed in patients with Lowe syndrome and patients with Dent 2, reduced plasma bicarbonate levels (Figure 2G) and acidemia were also detected in cDKO mice (Figure 2H). Collectively, these results showed that cDKO mice developed the renal Fanconi syndrome. Proximal tubulopathy is observed in cDKO mice. (A) Immunoblots of urine retinol binding protein, vitamin D binding protein, and albumin normalized to urine creatinine concentration. (B and C) Quantification of immunoblots in A standardized to urine from cDKO at 1 month. *P<0.05 (n=3). (D and E) Quantification of (D) urine phosphate and (E) calcium normalized to urine creatinine at 0, 1, 2, 3, and 4 months after doxycycline induction (black triangle, control; blue circle, Ocrl KO; and red square, cDKO mice). *P<0.05 (n=5). (F) Quantification of urine albumin normalized to urine creatinine at 3 months after doxycycline induction. *P<0.05 (n=5). (G) Blood bicarbonate (HCO3−) concentration and (H) blood pH at 0, 2, and 4 months after doxycycline induction (black triangle, control; blue circle, Ocrl KO; and red square, cDKO mice). *P<0.05 (n=5). Low molecular weight proteins that are freely filtered by the glomerulus are actively reclaimed by endocytosis in proximal tubule cells via the megalin and cubulin receptors, primarily by clathrin-mediated endocytosis.34 To determine whether the loss of low molecular weight proteins in cDKO mice reflects an endocytic defect, the uptake of β-lactoglobulin11 by proximal tubule cells after doxycycline induction was assessed. Red fluorescently labeled β-lactoglobulin was injected intravenously into the bloodstream of control, Ocrl KO, and cDKO mice at 2 weeks and 2 months after doxycycline induction. In both cases, 15 minutes after injection and kidney retrieval, macroscopic examination revealed a reddish color of both control and Ocrl KO kidneys (but slightly less intense in Ocrl KO mice), suggesting retention of labeled β-lactoglobulin in the parenchyma but not in cDKO kidneys (Figure 3C, Supplemental Figure 1C). Endocytic defects are observed in the cDKO mice proximal tubules. (A) Representative images showing uptake of Alexa 546–labeled β-lactoglobulin (red) of control and Ocrl KO kidney proximal tubule by immunofluorescence at 15 minutes, but it was not observed in the cDKO kidney proximal tubule at identical exposure times. FITC-LTA is shown in green. Scale bars, 10 μm. (B) Representative images showing uptake of Alexa 546–labeled dextran (red) in the control and Ocrl KO kidney proximal tubule by immunofluorescence at 10 minutes, but it was not observed in the cDKO kidney proximal tubule at identical exposure times. FITC-LTA is shown in green. Scale bars, 10 μm. (C) Whole kidneys of control, Ocrl KO, and cDKO mice in A revealing reduced uptake of Alexa 546–labeled β-lactoglobulin in the cDKO mice. (D) Quantification of Alexa 546–labeled β-lactoglobulin uptake in A, where the cytoplasmic to tubular brush border lactoglobulin intensity is calculated and expressed as the internalization ratio. *P<0.05 (n=3). (E) Quantification of Alexa 546–labeled dextran uptake in B, where the cytoplasmic to tubular brush border dextran intensity is calculated and expressed as the internalization ratio. *P<0.05 (n=3). (F) Representative light microscope image of control, Ocrl KO, and cDKO mice kidney sections stained with 3,3′-diaminobenzidine. Scale bars, 50 μm. (G) Representative electron microscopy micrographs showing the subcellular localization of HRP in kidney proximal tubules at 5 minutes after HRP injection in control and cDKO mice. HRP uptake (arrowheads) is observed in control but not cDKO mice. Scale bars, 500 nm. Consistent with these observations, microscopic analysis of the fluorescence in frozen sections of the same control and Ocrl KO kidneys showed the presence of red fluorescence in vesicles underlying the apical brush border of proximal tubule cells (slightly less prominent in Ocrl KO), which was labeled by the proximal tubule brush border marker Lotus tetragonolobus (LTA) (Figure 3A and quantified in Figure 3D, Supplemental Figure 1A). In contrast, no fluorescence was observed in the proximal tubules of the cDKO mice under identical image acquisition conditions (Figure 3A and quantified in Figure 3D). Fluid-phase endocytosis also seemed to be strongly impaired as revealed by the uptake of fluorescently labeled dextran at 2 weeks and 2 months after doxycycline induction. Ten minutes after injection, dextran fluorescence was abundant in the cortical region of proximal tubule cells under the brush border (Figure 3B and quantified in Figure 3E, Supplemental Figure 1B) but nearly absent in the same cells of cDKO mice with identical acquisition parameters. Likewise, a defect in the uptake of horseradish peroxidase (HRP), also a marker of fluid-phase endocytosis, was observed by both light and electron microscopy-cytochemistry in proximal tubules of cDKO mice after its injection in the bloodstream (Figure 3, F and G). In proximal tubules of control mice, abundant electron–dense HRP reaction product could be observed within 5 minutes after the injection in apical tubule–vesicular structures underlying the plasma membrane, whereas no such labeling was observed in cDKO mice (Figure 3G). Collectively, analogous to what has been observed in Clcn5 KO mice and Dent 1 disease,11 proximal tubule cells that lack both OCRL and INPP5B display a major endocytic defect. The defect in the internalization of β-lactoglobulin, a receptor-mediated process,11 suggested the occurrence of a defect in clathrin-mediated endocytosis in the cDKO mice (Figure 3A). To further validate the presence of this defect, in addition to a defect in fluid-phase endocytosis, the dynamics of the sodium phosphate cotransporter type 2a (NaPi2a), which is endocytosed through clathrin-coated pits in response to parathyroid hormone (PTH) stimulation,29 was examined at 1 month after doxycycline induction. Fifteen minutes after intraperitoneal injection of PTH, a rapid translocation of NaPi2a from the apical surface to the subapical region was observed in control and Ocrl KO mice but not in vehicle (PBS)-injected mice (Figure 4, A and B and quantified in Figure 4D). In contrast, no obvious translocation of NaPi2a was observed in cDKO mice at the same time point after PTH injection using identical image acquisition conditions (Figure 4C and quantified in Figure 4D). A modest translocation was observed 60 minutes after injection of a higher PTH dose, indicating responsiveness of the PTH receptor to PTH in the cDKO mice (quantified in Figure 4D, Supplemental Figure 2A). Uptake of NaPi2a after PTH treatment is impaired in the cDKO mice. (A) Representative immunofluorescence images of control kidney proximal tubules at 1 month after doxycycline induction stained with NaPi2a 15 minutes after vehicle or PTH injection. FITC-LTA is shown in green. Scale bars, 10 μm. (B) Representative immunofluorescence images of Ocrl KO kidney proximal tubules at 1 month after doxycycline induction stained with NaPi2a 15 minutes after vehicle or PTH injection. FITC-LTA is shown in green. Scale bars, 10 μm. (C) Representative immunofluorescence images of cDKO kidney proximal tubules at 1 month after doxycycline induction stained with NaPi2a 15 minutes after vehicle or PTH injection. FITC-LTA is shown in green. Scale bars, 10 μm. (D) Quantification of NaPi2a internalization (A–C) (Supplemental Figure 2A), where the cytoplasmic to tubular brush border Napi2a intensity is calculated and expressed as the internalization ratio (black bar, control; blue bar, Ocrl KO; and red bar, cDKO mice). *P<0.05 (n=3). (E) Plasma and (F) urine PTH levels in control, Ocrl KO, and cDKO mice. *P<0.05 (n=4). The defective internalization of NaPi2a, the major regulator of phosphate reabsorption in kidney proximal tubules,35 appears in contrast with the observed increased phosphaturia (increased residence of NaPi2a at the apical plasma membrane would be predicted to result in increased phosphate reabsorption). 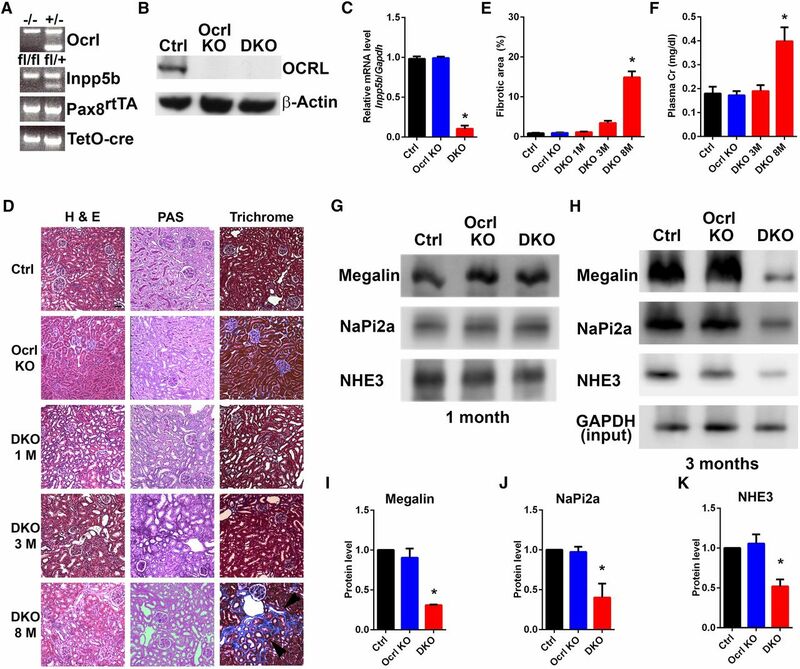 A similar apparent discrepancy, namely robust phosphaturia despite impaired and delayed PTH–dependent internalization of NaPi2a, was reported previously in the Clcn5 KO mice.11 The underlying mechanism remains to be precisely understood. As in Clcn5 KO mice, the levels of plasma and urine PTH were increased in cDKO mice relative to controls (Figure 4, E and F). However, no difference in PTH receptor expression (Supplemental Figure 2B) or concentration of FGF-23, a bone-derived factor also known to induce phosphaturia, were found (Supplemental Figure 2C). The similar kidney proximal tubule defects observed as a consequence of the loss of either OCRL (Lowe syndrome and Dent 2) or CLC-5 (Dent 1) in human patients36 suggests that the function of two proteins may affect a shared physiologic process. Mouse KO studies showed that absence of CLC-5 produces a strikingly robust endocytic defect at the apical pole of proximal tubule cells.11 Thus far, whether a similar dramatic endocytic defect results from loss of OCRL could not be assessed, because Ocrl KO mice did not exhibit obvious pathologic manifestations of disease.23 A perturbation of the endocytic pathway (primarily in the endosomal system downstream of the internalization reaction) has been reported in various OCRL knockdown or KO cell models.15,19,21 Moderate defects in the internalization reaction of endocytosis have been observed in fibroblasts derived from patients with Lowe syndrome.19 Additionally, an endocytic defect has been observed in the pronephric tubule of zebrafish, where Ocrl expression was diminished by morpholinos.15 It was hypothesized that the redundancy of OCRL with INPP5B in mouse kidney cells may explain the discrepancy between the mouse Ocrl KO phenotype and the clinical human manifestations observed in Lowe syndrome. Consistent with this possibility, replacement of the Inpp5b gene with the human INPP5B gene in Ocrl KO mice produced defects reminiscent of Lowe syndrome.37 However, the cellular basis of this defect was not explored. In this analysis, we show that the combined loss of Ocrl and Inpp5b in an adult mouse produces a massive endocytic defect at the apical pole of kidney proximal tubule cells. This defect may reflect the strong dependence of apical cell endocytosis on actin dynamics,38 which in turn, is regulated by PI(4,5)P2, the main substrate of OCRL and INPP5B.39 Why the absence of only OCRL is sufficient to produce clinical manifestations in humans but not in mice remains to be explored further, although differences in the regulation of INPP5B expression in the two species or differential alternative splicing are the most likely explanation.26,40 The heterogeneous phenotypic spectrum of human disease in patients with mutations in OCRL—consistent presence of kidney defects but occurrence of nervous system and/or ophthalmologic defects in only a subset of patients8,14,41—suggests that differences in INPP5B compensation may also occur in humans. We note that, in our study, minor defects at the cellular levels were observed even in mice that lack only OCRL, although clearly insufficient to produce overt impairment of kidney function. Why the endocytic defect begins mildly after doxycycline induction increases in severity over several months remains unclear. One possibility is that early defects in reabsorption may produce progressive tubular cell damage. In conclusion, our results prove the partially overlapping roles of OCRL and INPP5B in kidney proximal tubule cells. They provide in vivo evidence that loss of OCRL/INPP5B function results in the pathologic manifestation of disease at least in part by producing a striking defect in endocytosis at the luminal pole of these cells. cDKO mice may represent a useful animal model to further study mechanisms of Lowe syndrome and Dent 2 disease and test therapeutic approaches. Inpp5bfl/fl mice,28 Ocrl−/− or Ocrly/− mice,23 and doxycycline–inducible Pax8rtTA TetO-cre mice27 were previously described. To induce Inpp5b gene recombination, 2.0 mg/ml doxycycline was added to drinking water (also supplemented with 5% sucrose) for 2 weeks starting at postnatal week 8. Mouse kidney proximal tubular brush border membranes were isolated as previously described.52 Briefly, mouse kidney cortex was cut and homogenized by a Polytron; 12 mM MgCl2 was added to the lysate and incubated on ice for 15 minutes. The lysate was centrifuged at 4500 rpm for 15 minutes, and the supernatant was collected and centrifuged at 25,000×g for 30 minutes. The pellet was then resuspended and centrifuged again at 25,000×g for 30 minutes, and the pellet was stored at −80°C until used for SDS-PAGE. Bovine β-lactoglobulin (20 μg/kg body wt; Sigma-Aldrich) conjugated with Alexa Fluor 546 (Invitrogen) or 10 kD Alexa Fluor dextran (20 μg/kg body wt; Invitrogen) was injected via tail vein; 15 minutes after the injection of β-lactoglobulin or 10 minutes after injection of dextran, mice were briefly perfused with PBS, and the kidney was removed and fixed with 4% PFA. Kidney sections were then stained with FITC-conjugated LTA, and images were acquired by a Andor CSU-WDi Spinning Disc Confocal Microscope equipped with a Nikon Ti-E Cfi Plan Apo Lambda 60× Oil Objective. For quantification of β-lactoglobulin internalization, the fluorescence overlapping with the brush border (area of the section positive for LTA fluorescence) and the fluorescence in the underlying cytosolic region were calculated. Internalization was then expressed as a ratio between the internal fluorescence and the brush border fluorescence. For quantification of dextran internalization, the total internalized fluorescence signal per unit area was calculated. ImageJ (National Institutes of Health [NIH]) was used for the analysis. HRP (1.2 μg in each mouse; Sigma-Aldrich) was injected via the cannulated jugular vein. Mice kidneys were perfusion fixed by periodate-lysine-paraformaldehyde buffer 5 or 10 minutes after HRP injection. For light microscopy, 4-μm-thick frozen sections were cut, processed for HRP cytochemistry, and mounted in SlowFade (Thermo Fisher Scientific). For electron microscopy, small pieces of kidney cortex were further fixed in 2.5% glutaldehyde in 0.1 M sodium cacodylate buffer, processed for HRP cytochemistry, postfixed with 2% OsO4 and 1.5% K4Fe in the same buffer, en bloc stained with 2% uranyl acetate, embedded in Embed 812, and thin sectioned. Images were acquired with a Morada 1k×1k CCD Camera (Olympus) using a Philips CM10 Microscope at 80 kV. Rat PTH (20 μg; Bachem) was injected intraperitoneally 2 weeks after the end of the doxycycline induction; 15 minutes after the injection, mice were briefly perfused with PBS, and kidneys were removed and fixed by 4% PFA. For the longer– and higher–dose PTH treatment, 80 μg rat PTH was administrated intraperitoneally followed (after 30 minutes) by a 20-μg PTH injection into the tail vein. One hour after intraperitoneal injection, kidneys were removed and fixed by 4% PFA. For quantification of internalization, the same method described above for β-lactoglobulin was used. Biochemical analyses of plasma and urine and SDS-PAGE were carried out by standard procedures (Supplemental Material). All data are presented as mean±SD. Statistical significance was determined with P value <0.05 by two–tailed paired t test. All animal experiments were approved by the Yale University IACUC. All work was carried out in accordance with the principles and procedures outlined in the NIH guidelines for the care and use of experimental animals. We thank Dr. K. Sauer (Scripps Research Institute) and Dr. S. Somlo (Yale University) for providing Inpp5b fl/fl and doxycycline–inducible Pax8rtTA TetO-cre mice, respectively. This work was supported in part by George O’Brien Kidney Center at Yale grant P30DK079310 (to T.W., P.D.C., and S.I.) and National Institutes of Health grants DK083294 (to S.I.) and DK 093629 (to S.I.). K.I. and D.M.B. contributed equally to this work. This article contains supplemental material online at http://jasn.asnjournals.org/lookup/suppl/doi:10.1681/ASN.2016080913/-/DCSupplemental.